Originally a halfback in college, Dorow shifted to quarterback as a sophomore and guided Michigan State to a 9-0 record as a senior in 1951. He was chosen by the Washington Redskins in the third round of the ’52 NFL draft but first had to fulfill a military commitment before joining the Redskins in 1954. Starting QB Eddie LeBaron having departed for the CFL, Dorow saw considerable action and threw for 997 yards and 8 touchdowns, although giving up 17 interceptions. With the return of LeBaron in ’55, Dorow saw scant action as a reserve but when LeBaron suffered a knee injury in 1956 he started seven games and played well enough to earn Pro Bowl recognition. 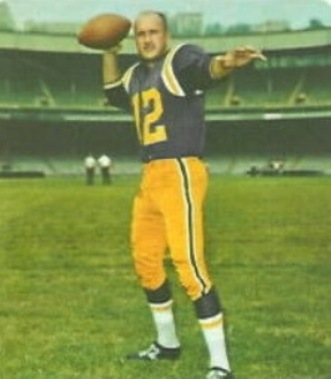 However, an offseason contract dispute caused Dorow to be traded to Philadelphia where he was little used in ’57 and he moved on to Canada with Saskatchewan and British Columbia in 1958 and Toronto in ‘59. Overall in the CFL, Dorow passed for 2363 yards and 17 TDs, with 35 INTs, and, highly mobile, rushed for 214 yards. With the formation of the AFL in 1960, Dorow joined the New York Titans and proved to be a good fit in Head Coach Sammy Baugh’s pass-oriented offense, where he had outstanding receivers in flanker Don Maynard and split end Art Powell. While not having great arm strength, he was a daring play caller and possessed excellent leadership qualities. Titans went 7-7 to finish second in the AFL Eastern Division while leading the league in touchdowns (51) and scoring (380 points). Dorow followed up in 1961 by leading the AFL in pass attempts (438) and completions (197), as well as rushing yards by a quarterback (317) for the second straight year, but also interceptions thrown (30) as the Titans again went 7-7. He was selected for the first AFL All-Star Game. Suffering from a sore shoulder, Dorow was traded to Buffalo and started four games before further damage to his arm ended his career. Overall in the AFL, Dorow passed for 5732 yards and 47 TDs while giving up 63 interceptions and rushed for 827 yards and 11 touchdowns. In four NFL seasons, he threw for 1976 yards and 17 TDs with 39 INTs and ran for 323 yards and 5 scores. Dorow was selected to one Pro Bowl and one AFL All-Star Game. He went into coaching and was head coach of the CFL’s Hamilton Tiger-Cats in 1971.